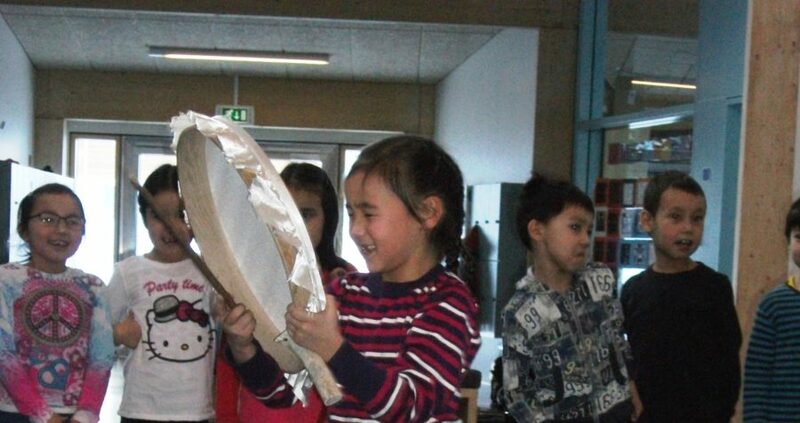 Qilaatersorneq, drum dancing and singing, is a traditional form of Inuit music and expression. Historically, dances, tivaneq, songs and stories, inngerutit, were frequently accompanied by the beating of a drum in Greenlandic Inuit society. The drum was used as entertainment, spiritual ceremonies and to solve interpersonal conflicts and disputes. During these song-duels, iverneq, combatants would take turns singing and composing lyrics, pisit, that were meant to shame or lampoon the opposing party. Victory was usually determined by laughter of the audience or if one of the combatants gave up in frustration. Drum singing helped de-escalate conflict between people and groups and maintain good relations in the community. When Protestant missionaries arrived in Western Greenland in the 18th century drum dancing and singing were regarded as heathen and in direct opposition to the teachings of the Church and therefore forbidden. Over the following centuries, drum dancing disappeared in Western Greenland, but the tradition survived in Eastern and Northern Greenland due to late contact with the outside world. In 2011 Nunatta Katersugaasivia Allagaateqarfialu, the Greenland National Museum and Archives, initiated the pilot project Eriagisassanik Attassisut, which was completed in 2012. The experienced drum dancers and singers Leif Saandvig Immanuelsen and Hivshu Robert Peary II were appointed Living Cultural Treasures as a means to safeguard and promote Inuit drum dancing and singing. The Living Cultural Treasures toured Western Greenland, visiting 15 institutions and associations in Nuuk, Maniitsoq, Aasiaat, Qasigiannguit and Ilulissat. During these visits they held workshops and shared their traditional knowledge of drum construction and taught traditional dances and songs to children and youths in primary and secondary schools. The aim of the project Eriagisassanik Attassisut is to strengthen traditional practices by promoting them through hands-on teaching in primary and secondary schools. The sharing, transmission and communal exploration of traditional practices encourage the continuity of a deep historic memory and an emotional connection to any important ancestral tradition. Hands-on teaching – an imperative in the project. Photo: Nunatta Katersugaasivia. 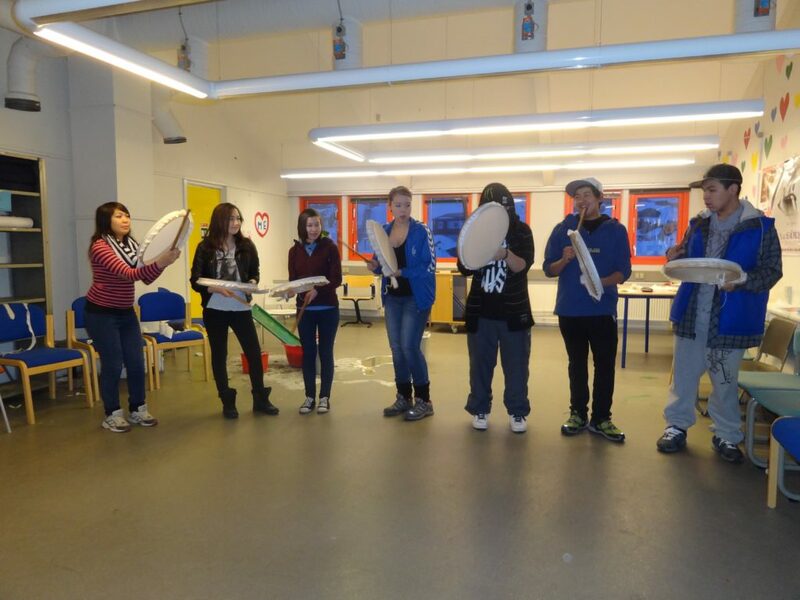 The project was initiated with a three-week research- and workshop for the participants from Nunatta Katersugaasvia Allagaateqarfialu and the designated Living Treasures. The research- and workshops resulted in fitted practical, theoretical and educational programmes for the different age groups on the tours along the Greenlandic west coast. The Living Cultural Treasures helped connect the youth with different expression alternatives. Cultural mentors encourage people to learn new expression ways and develop a relationship to the shared cultural past through usage. A key element of the project is that the cultural mentor supports the learning process instead of acting like an instructor. The aim is to encourage and support people to learn, develop and share the cultural activities together. Nunatta Katersugaasivia (The Greenland National Museum) was founded in 1966 and merged with the National Archives in 1991. The collections cover the cultural history of Greenland from the first archaeological cultures 4500 years ago until the people of today.